A springtime ritual for many families is opening up their lakeside camp or cottage for the summer. To help protect the lake and wildlife that make camp so special, it is important to conduct this yearly procedure in such a way to minimize harm. Raking - DO NOT rake up the duff layer of leaves and pine needles that build up under the trees. These leaves act like a sponge and filter, and help prevent pollutants from getting into the lake. 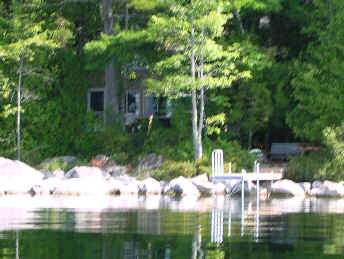 As a cottage owner it is one of the best things you can do to protect lake water quality. Dock painting - Paint or stain docks away from the lake and allow at least 14 days of drying time before putting them in the water. Make sure to clean brushes, etc. away from the water to prevent materials from washing into the lake. Check for erosion - Check the shoreline and other areas of the property for soil erosion. Stabilize these areas with plants or rock riprap. If more than minor maintenance and repair is required, or if structural measures are necessary, contact your local code enforcement officer and the DEP to determine if permits will be needed before doing the work. Septic system - Check your septic system's leachfield for any breakouts and consider having the tank pumped if it has not been pumped recently (tanks should be pumped every 2-3 years for year-round residences and every 4-5 years for seasonal residences). A properly functioning septic system prevents harmful pollutants from getting into the lake. Boats - When preparing your boat for another season, make sure to dispose of drained lubricating oils at a recycling facility or bring the oil to your local dealer for disposal (see list of oil recycling locations). Wash the boat away from the water or at a commercial car wash. Check to make sure that the boat, trailer and other equipment are free of any hitchhiking plants. And tune-up that motor. Cleaning products - When using cleaning agents, use natural products like baking soda and lemon juice when cleaning and save money while protecting your health and nature. Paint color - When using paints and stains, consider using earth tone colors so that buildings and other structures will blend better with the natural shoreline. 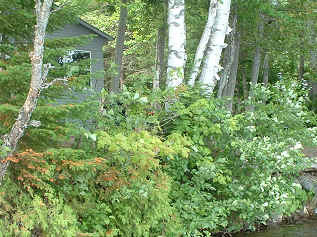 Drain Pipes - Winterizing a cottage requires preventing pipes from freezing. Drain the water system to ensure that it won't freeze, do not use anti-freeze to protect plumbing. Antifreeze is toxic and it poses a threat to ground and surface waters, not to mention the danger of it being ingested by pets. Adding antifreeze to plumbing fixtures is not necessary provided all the fixtures are completely drained. Protect from rodents - Damage from rodents such as mice and squirrels is also a concern for cottage owners. Refrain from using pesticides or poisons. To prevent these unwanted guests, inspect the cottage inside and out to make sure there are no openings for rodents to enter. Remove all food sources from the cottage before you close it. Check for erosion - To make sure that shorefront areas will not succumb to ice or wave damage, inspect the shoreline thoroughly. Stabilize any eroding areas with plants or rock riprap if necessary. If using riprap, patching a retaining wall, or doing anything more than minor maintenance and repair, state and local permits are required, so plan accordingly. This is also a good time to inspect parking and landscaped areas for signs of erosion. Remove dock - When removing docks and boats from the water try to store them in an area that will not kill vegetation. A stable shoreline and healthy vegetation are important in keeping eroding soil from harming water quality. Boats - Do not try to drain gasoline from fuel tanks of outboard motors or other power equipment. Instead, use fuel stabilizer (available from your dealer or auto parts store) to keep fuel fresh for next season. Winterize your engine(s) away from the water. When changing lubricating oils, collect the oil and bring it to your dealer or a recycling facility for proper disposal (see oil recycling list for locations). Wash boats away from the water, preferably at a commercial car wash. Many detergents and motor oils contain chemicals that can pollute the lake and harm fish.